Some people, maybe most, don't really get what OTR means. Many outsiders just see crime and old buildings. But most who live here, understand that Over-the-Rhine is an unparalleled attribute to this great city. It has incredible history, beautiful and diverse people, struggles of all kind, and the largest intact collection of Italianate buildings in the country. Unfortunately there are some people who work here, maybe even some who live here who, also, just don't get it. They just don't get the gift our predecessors left us. John Young is apparently one of those people. He is the CEO of the Freestore Foodbank, and he is on a mission to expand foodbank operations in OTR, and these two measly buildings, 1606 and 1608 Walnut, are in his way. Instead of keeping our heritage, instead of housing maybe a dozen people, Mr. Young has a vision to turn these two beautiful buildings into........ parking for semi-trailers. What a vision. Many people have had similar visions, and have created vacant lots and parking lots in their wake. Just across the street, I can remember Husman's demolishing a cool building at the flat-iron intersection of Walnut and Moore Street 15 years ago. They left a parking lot, and now where is Husman's? Gone. Just like the Freestore will be someday. The Freestore's proposed site plan can be seen here. Their vision of the future involves more and more parking lots, and more demolition. UPDATE 2: I looked up the email address of John Young and sent an email urging them to reconsider. I also linked to this as well as leaving my full name and personal email. I really do hope they will reconsider. The Free Store suffers from the same myopia as the other OTR social agencies. Their services are needed now not downtown, but in Price Hill, Evanston, Faye Apartments, and Avondale. They are still fighting the last war. Some of the Free Store's board members belong to the Cincinnati Preservation Association. Where is CPA on this issue? Their mission is a separate issue. You could make the "feed the man or teach the man to fish" argument about foodbanks, or you can argue about their location, as you have. That's not my beef. If true, it is interesting that Board Members of the CPA would be part of this. You need to see the bigger picture. This will help the people down there. They help a lot of people - more and more every year. That street is busy. where do you expect them to put the trucks to get the food to the non profits that use/need it. ^Yes it will help them by destroying their houses. Everyone seems to want to help OTR by tearing it down. Thanks a lot. As for where they should park their semis: I have a smartass answer and a serious one. The serious one is: 1250 Tennesse Avenune, where their warehouse is. How exhaustive a checklist does the Cincinnati Preservation Association use to assess the cultural/historical impact of development? Is it as detailed as an Environmental impact statement? Does the public hold a meeting to review and provide feedback to the cultural/historical impact study? Have you even been inside? are they livable? The link you provide lists these buildings as having 3 units each. It also lists the building I currently live in as having 9 units. The list is NOT a list of vacant buildings, and does not have VAC (meaning vacant)next to this address as other buildings do. Try again. Buildings in this condition are in high demand by renovators. Trust me, if they were made available for rehab they would get restored. Every building requires maintenance, and if that maintenance is not done then eventually the building first becomes unlivable, then later, unsalvageable. These buildings suffer from defferred maintenance, but they are in solid structural condition and are definitely salvageable. You don't have to be nasty. I am not disagreeing with you. I too love OTR. I am just trying to figure it all out, neutrally. And 1606 is on the abandonded/vacant building list. Sorry, I was getting a little worked-up. Not my usual style at all. I've just seen so much demo over the years, it drives me crazy. Everyone thinks their case is unique and deserves special consideration. I can almost understand demo for a new building, but for parking semi-trucks!! arghh. Then to see their future, plans....they want to make that whole block look like swiss cheese! 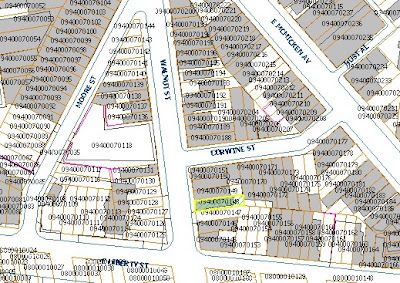 By the way, most buildings, before they are rehabbed in OTR make it on the VBML list, at least for a while. Could you please share Young's e-mail address? I'd like to write him too. Mr. Young responded to my email by requesting that I take a tour of the Freestore. I will report back afterwards. What a shame. I often wonder why some people lack the nostalgia for the unique and irreplaceable gems that Cincinnati has to offer. I can't help but be disappointed. 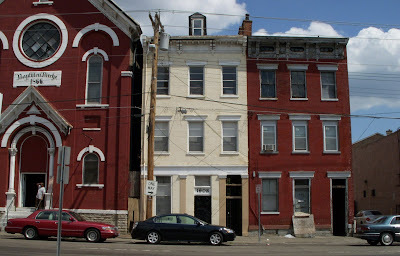 There are a good number of bldgs in OTR that are past the point of repair and probably should be taken down as a result. These bldgs do not look to be in that bad of shape, and to do it for semi-trucks parking is just disturbing. What a way to give back. This is madness! I cannot believe the latest site plan...I know the former director of the Free Store - you can bet he will be hearing from me today. Hopefully he will be able to persuade some sense into the current admin.